Smooth and fast, the Magnet fits most every roper's style. 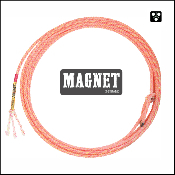 Inspired by Camish Jennings the MAGNET is uniquely small in diameter making it one of the fastest ropes you'll ever swing. Nylon Poly 3-Strand, Length: 32' Diameter:Small, Available Lays: Super Soft (SS), Extra Soft (XS), Soft (S).